Ms. Poirier joined HCP in 2014, and is an integral member of the firm’s national product liability, environmental, and toxic tort defense team. Ms. Poirier graduated from the University of Akron School of Law in May 2013, where she served as the Editor-in-Chief of the Akron Law Review. While at the University of Akron, Ms. Poirier was an intern at the United States Attorney’s Office and a judicial extern for the Honorable Judge Polster at the United States District Court for the Northern District of Ohio. 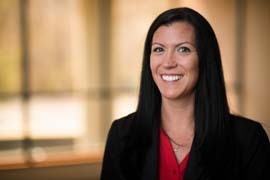 During law school, Ms. Poirier developed strong alternative dispute resolution skills as a mediator at the Akron Municipal Court. She also worked as a research assistant and a fellow for the Academic Success Program. She received the Scribes: American Society of Legal Writers Award, The David D. Dowd Sr. Memorial Award to Promote Public Service, The Ernest Karam Award for Academic Excellence, and CALI Awards for Excellence in Legal Analysis Research and Writing, and for Capital Punishment Litigation. Ms. Poirier resides in Summit County with her husband, Tim, and their daughter, Sophia. When not at the office, she enjoys practicing yoga, running, and hiking in the Summit County Metro Parks. She also volunteers as co-leader of her daughter’s Girl Scout troop.